I was listening to the local radio yesterday as I went about my business about town, they were interviewing a local vegetable grower who said crops are 5 to 6 weeks behind where they normally are at this time of year. I knew the season was behind although it seems to me that plants catch up at different speeds and some never really seemed to have been effected by the bad weather here this year. 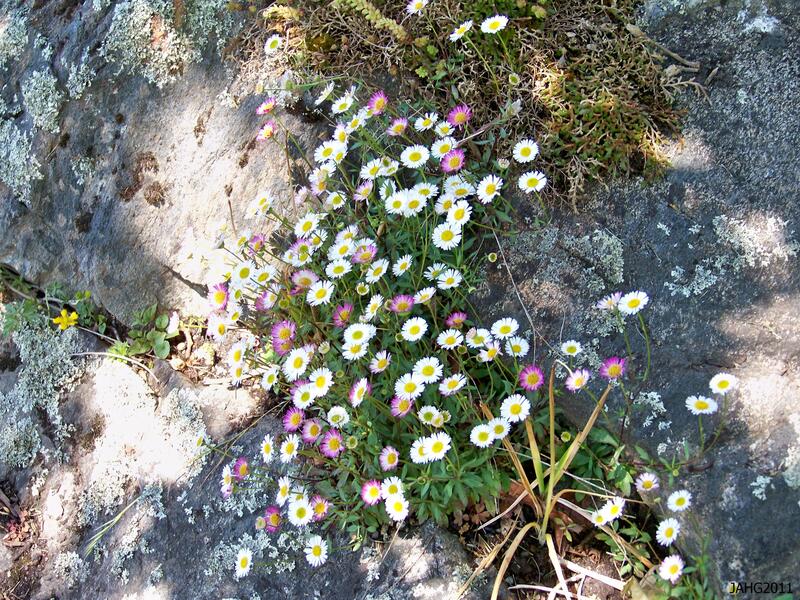 One plant which just rolls along without a care is Erigeron karvinskianus Latin American Fleabane. 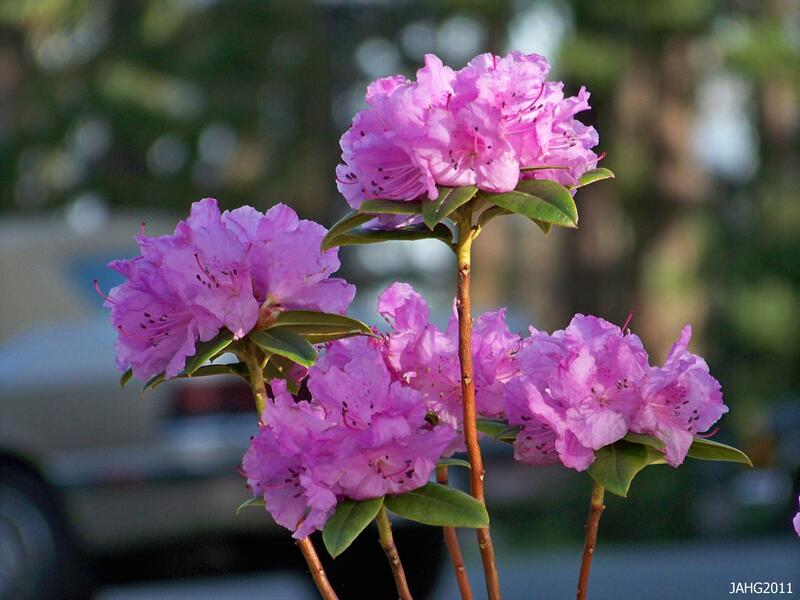 It is rarely out of flower at any time of the year. Erigeron karvinskianus (Latin American Fleabane) is a tiny sprawling plant perfect for containers,baskets and in rock cracks. There are many Erigeron and most come from North America and as the common name tells you E. karvinskianus comes from more southern areas. It is found growing from Mexico south into Venezuela. In its native habitat it grows in the mountains at 1200-3500m (4000-11000 ft.) where is is evenly moist throughout the year. Spanish Daisy, Latin American Daisy, Santa Barbara Daisy or Mexican Daisy and even Bony Tip Fleabane – all are referring to the same plant. With its tiny parts Erigeron karvinskianus does not seem out of place with other small plants here. 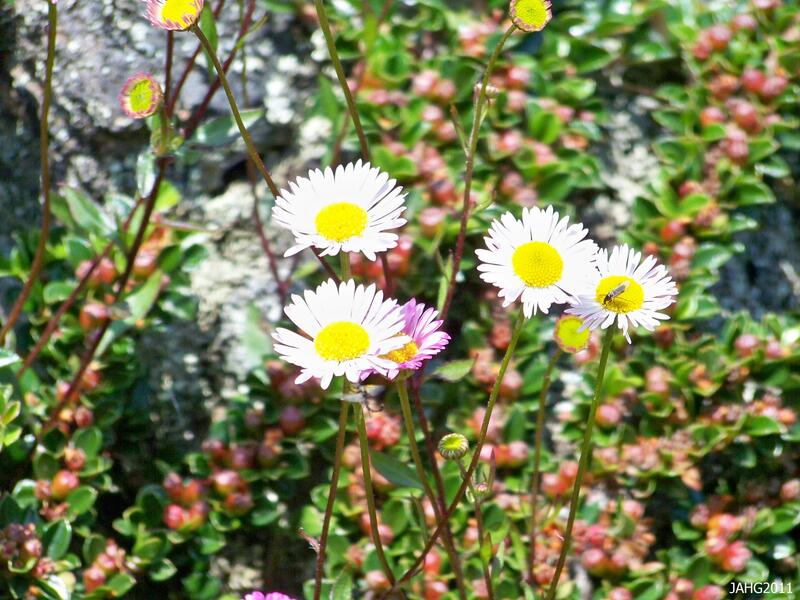 Erigeron isthought to be Greek eri=early and geron= old man. Karvinskianus refers to Baron Wilhelm Friedrich Karwinski von Karvin (von Karvin Karvinski) 1780-1855. He born in Hungary and was a naturalist with interests in Geology, Botany and particularly in the study of fossils from different periods. To this end he traveled to collect samples and the areas he went to was Brasil(1821-23) and Mexico(1827-32) . During his travels he sent back over 4000 plant specimens and several have been named after him, these include cactus, grasses and several others. He collected his sample of Erigeron karvinskianus while he was in Oaxaca Mexico. 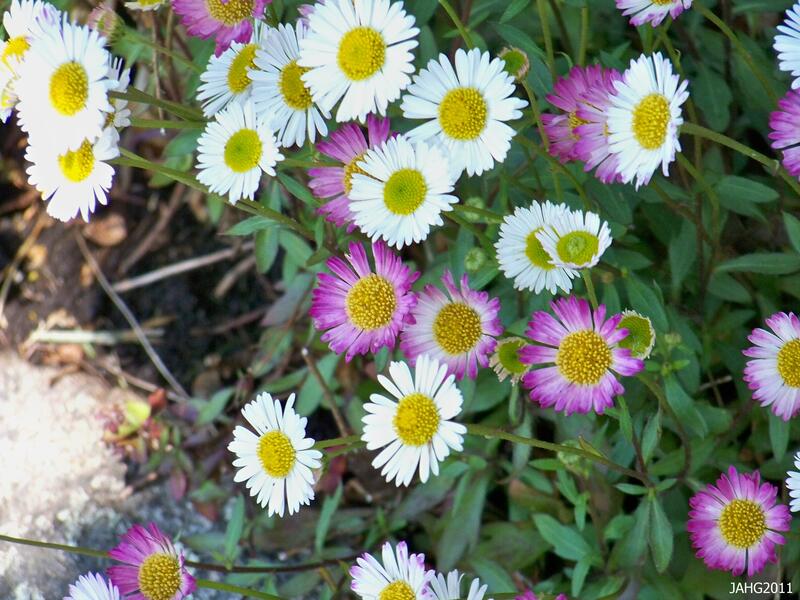 Part of the charm of South American Fleabane lies in flowers which open white and change into pink as they age. 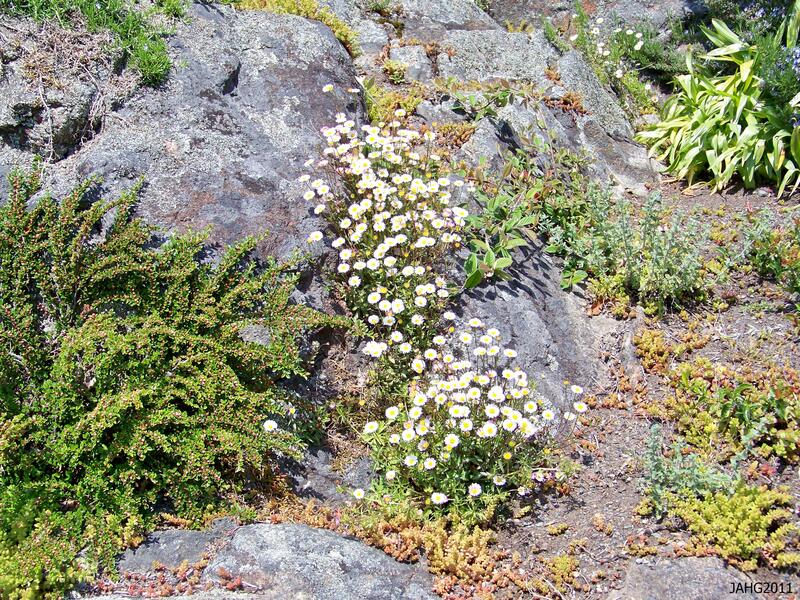 This effect is also seen in other Erigeron species. Erigeron karvinskianus is a very successful plant since it has been grown at sea level and in some areas it has become somewhat of a pest. In Australia and particularly it is not welcome (in these areas it is recommended to plant Branchyscome multifida which is similar looking). The selection ‘Profusion’ refers to the flowers but also could well refer to its ability to reproduce quickly. In Victoria it is controlled by the climate being on the very edge of it being able to exist as a perennial here, many plant will have died this winter and new seedlings will take their place. 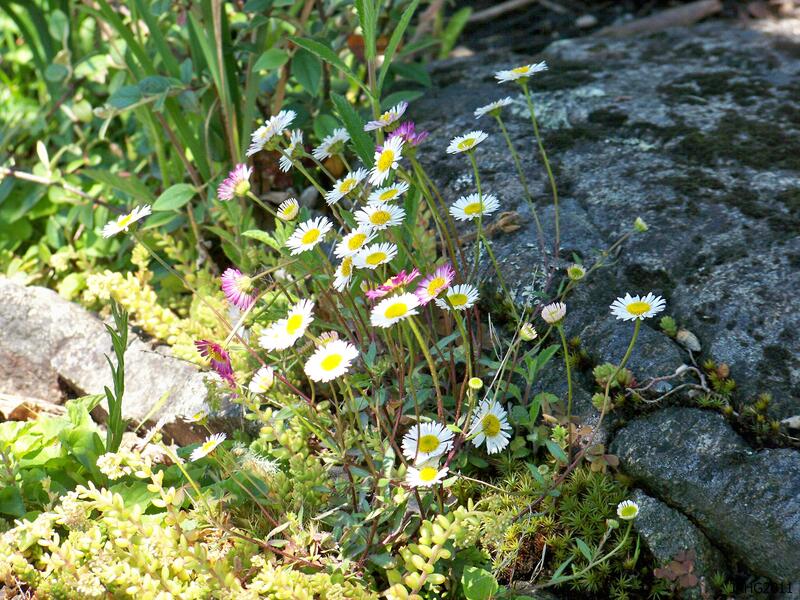 Here native Sedum, Cotoneasters and other mixed plants blend together in the rocks with Spanish Daisy to give a pleasing contrast in textures and color throughout the year. I first came to know this plant as a grower at a perennial nursery and thought that this plant might be a good container plant as it has proved to be in other areas. 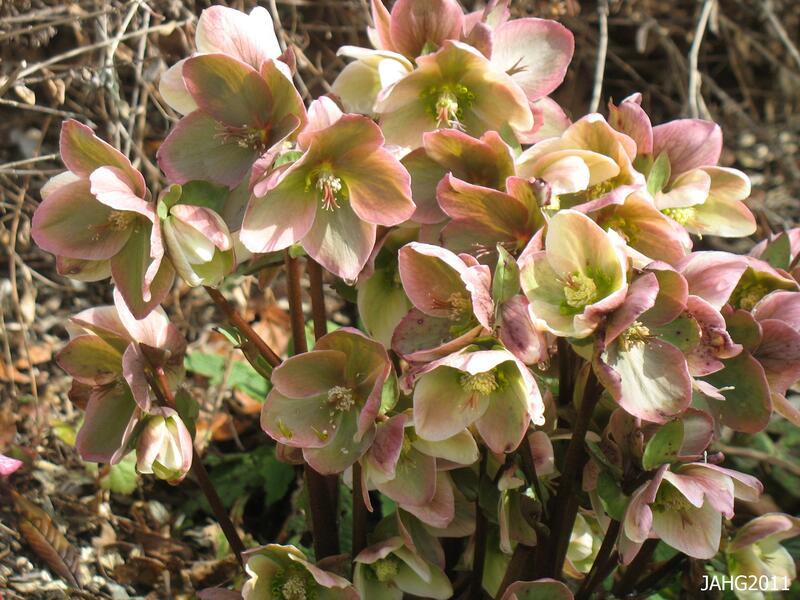 It has mainly been grown for this purpose as it is not hardy enough for most of Canada. 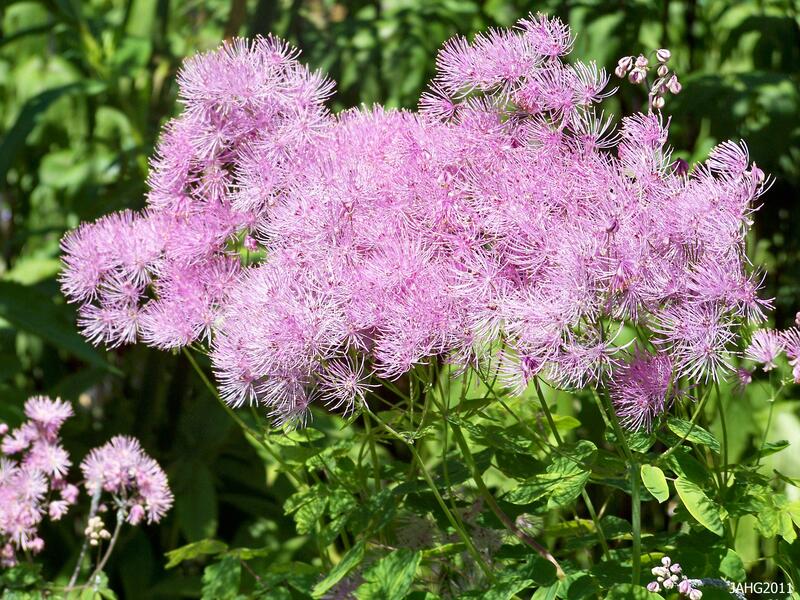 Here it can be grown as a short lived perennial which reseeds to refresh with new plants. 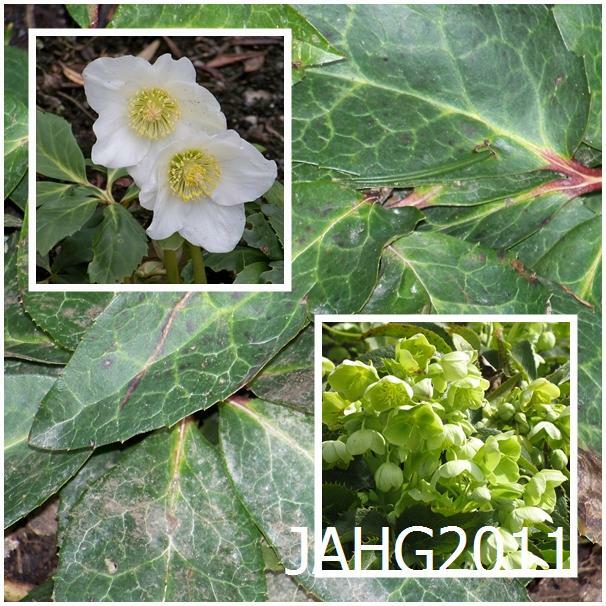 Victoria and nearby areas are the only places you will see it growing in gardens as a regular plant. The diminutive flowers on wiry stems of Erigeron karvinskianus are long lasting as they go through their metamorphosis from pure white to deep pink. …..Follow my trail to more interesting plant tails……..
Dicentra Disbanded, Welcome Lamprocapnos spectabilis. We I was very small going even a few house from home was a big adventure, I never knew what I would come across. I would walk up the lane with the big fences, past the garage at the corner and the decide which direction to turn. I would walk to the next block and turn and by the time I pasted the second white house I would want to go home. 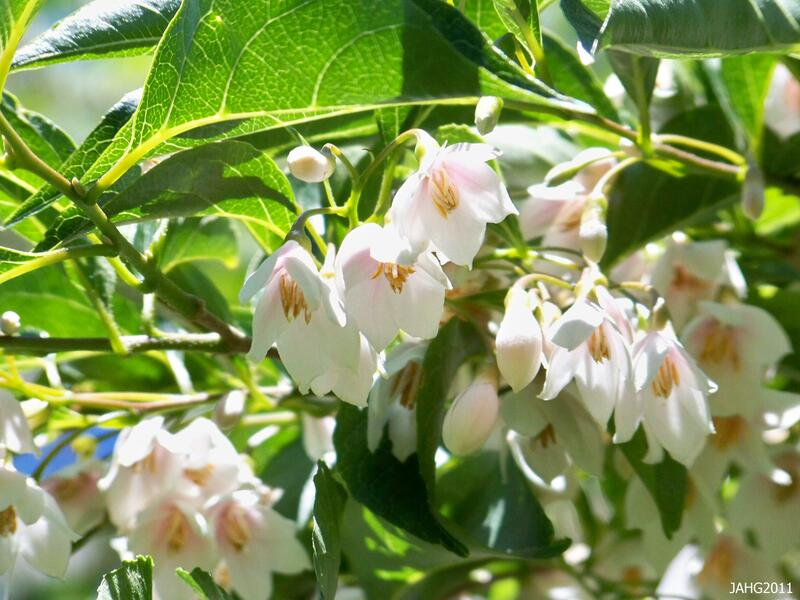 There I found a most peculiar plant with flowers that looked like hearts suspended which were on slender branches amongst the tender green leaves. Never knew such a beautiful plant existed and was in love with it instantly. Bleeding Hearts (Laprocapnos spectabilis) have been in my heart since that time and definitely piqued my curiosity about plants in a way that insured gardens would be a central feature in my life. 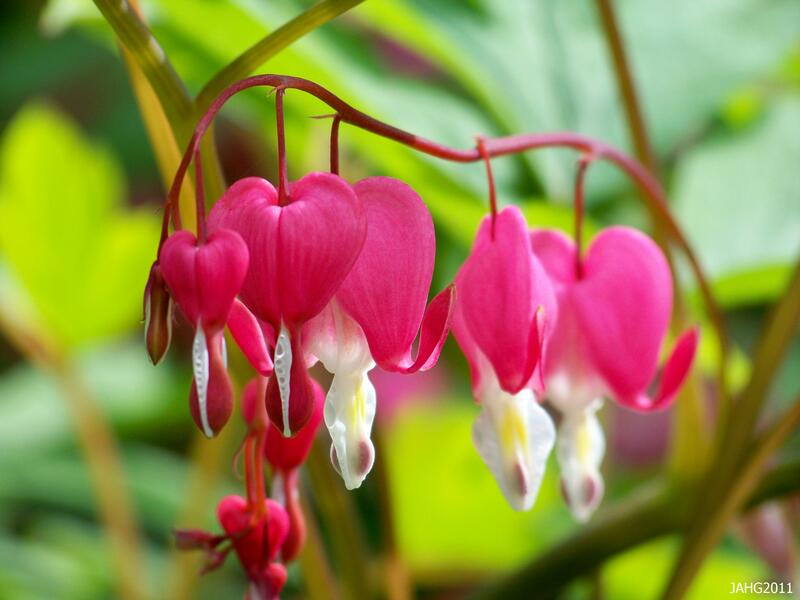 Any child would be fascinated by the Bleeding Heart(Lamprocapnos spectabilis) flowers. 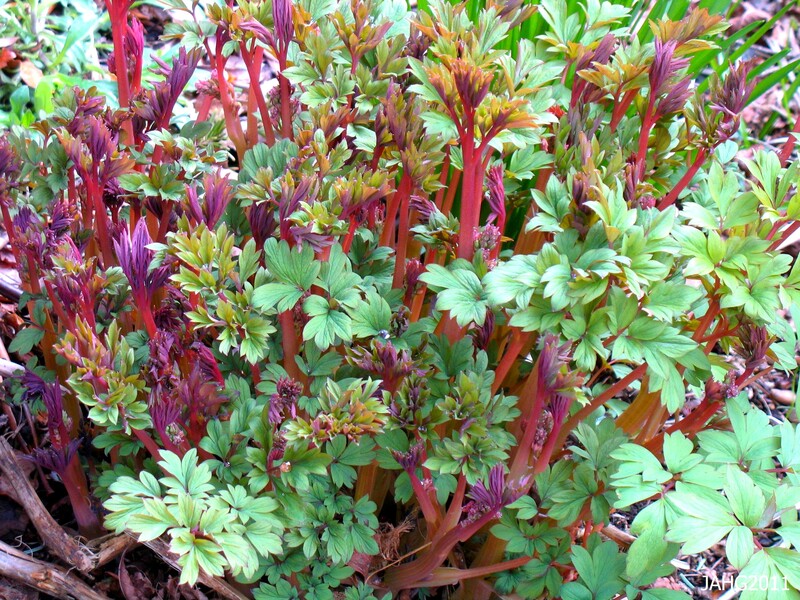 Whats this you say, I know this plant to be a Dicentra spectabilis…and what is this silly name you are now calling it Lamprocapnos spectabilis ?. Yes it is true the name has changed and just recently and we can thank our ability to see plants at a molecular level know so we change their family based on their genetic make up. 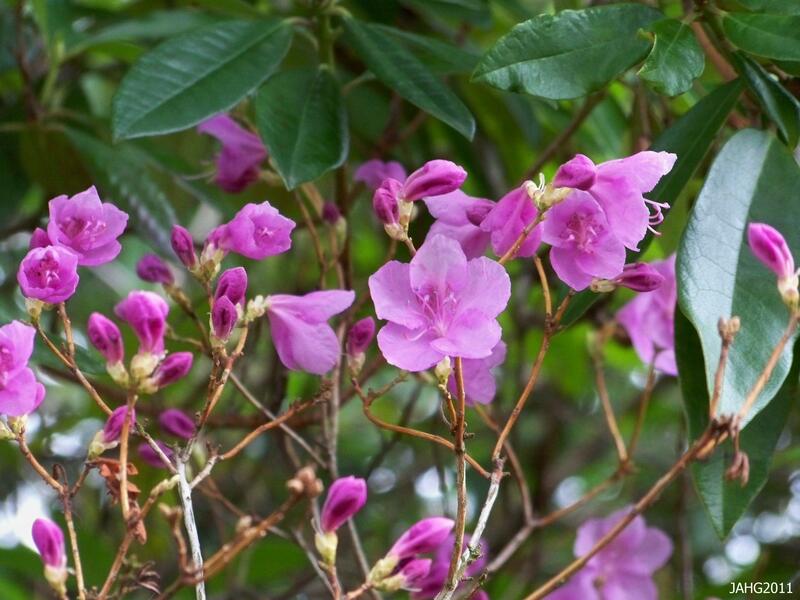 The original study appears to have been done in 1997 and the acceptance of the new name was accepted in late August 2006. this is not the first name change, originally it was classed as a Fumaria and later as a Dielytra. 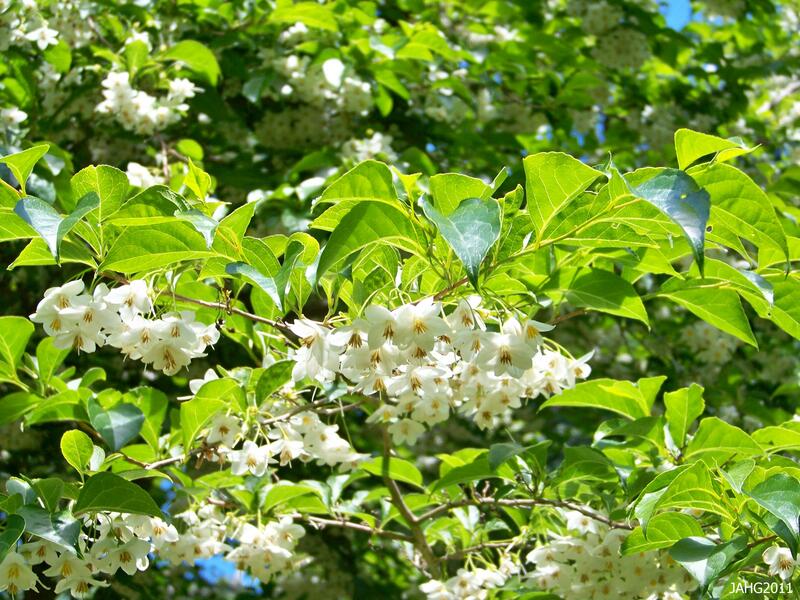 As for the common name, take your pick of : Bleeding Heart, Venus’s Car, Lady’s Locket, Lyre Flower, Tearing Hearts, Our Lady in a Boat, Chinese Pants and the list goes on. 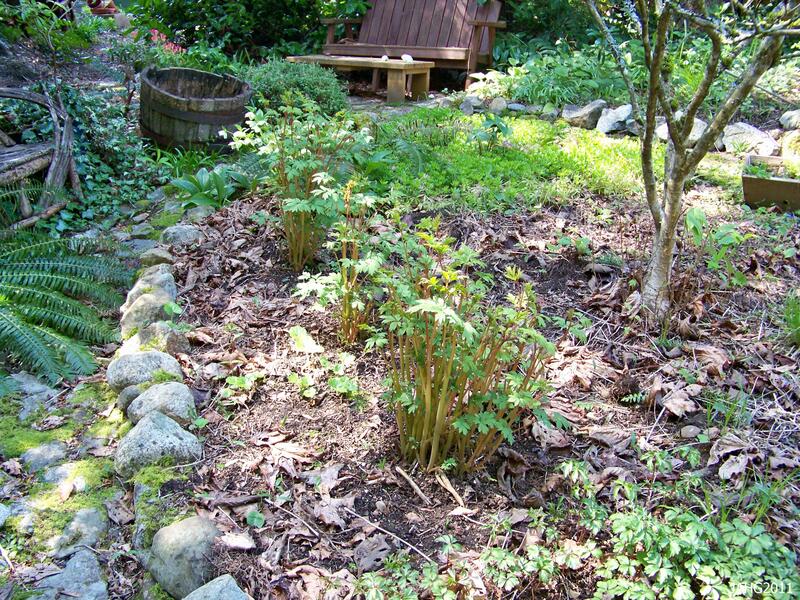 The brightly colored stems of Bleeding Heart (Lamprocapnos spectabilis) in the spring add excitement to the garden, you know something wonderful is on the way. Bleeding Hearts were first mentioned in “Vollstandige Lexicon der Gartneri und Botanik’ (1804) a book written by German Botanist Friedrich Gottlieb Dietrich(1765-1850). 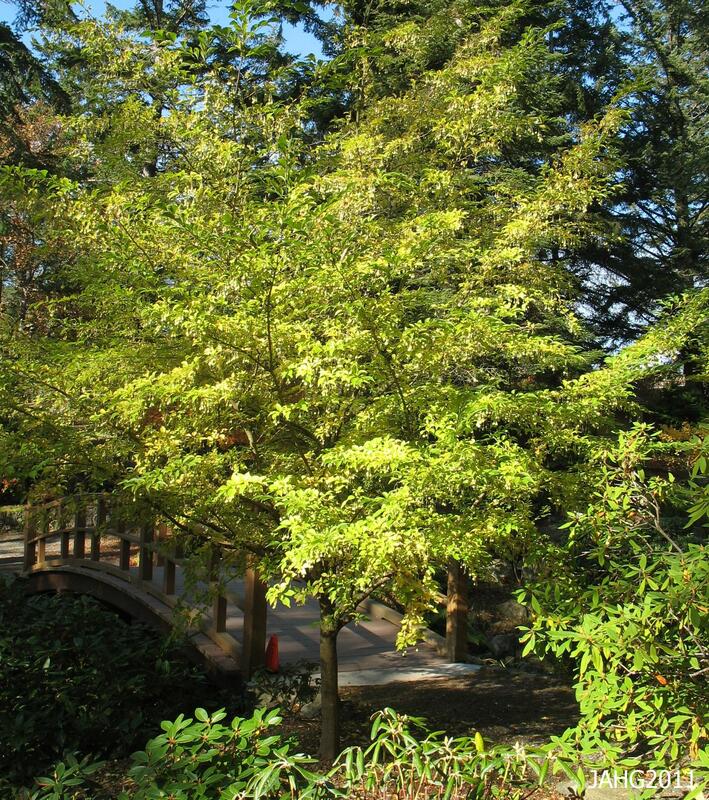 He was the designer and director of the Botanical Gardens in Eisenach and Wilhelmstal. During his lifetime he taught botany ,collected plants mainly in the Alps and was a Professor of Botany. 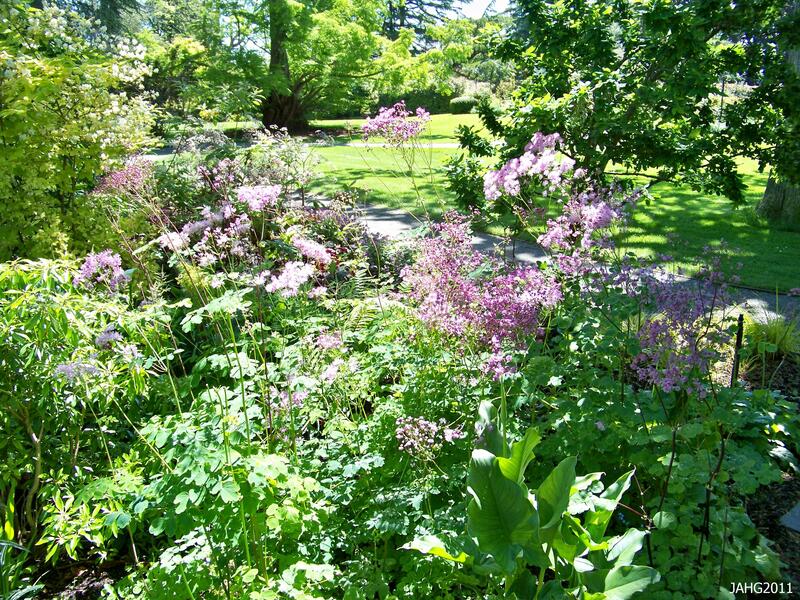 With his access to the gardens he was able to see many of the new plants be sent from other parts of the world to be catalogued. 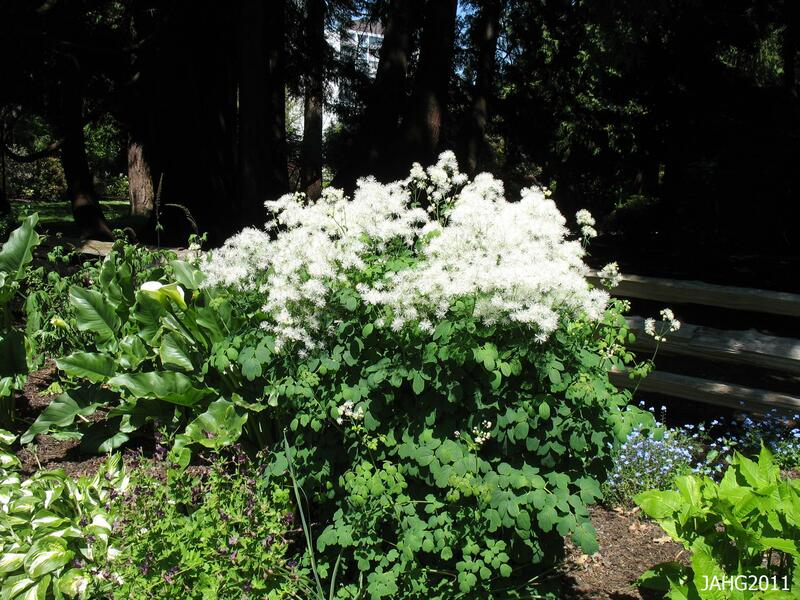 From the original mention of Bleeding Heart (listed as Fumaria) in 1804 it seems the plant was not long-lived. 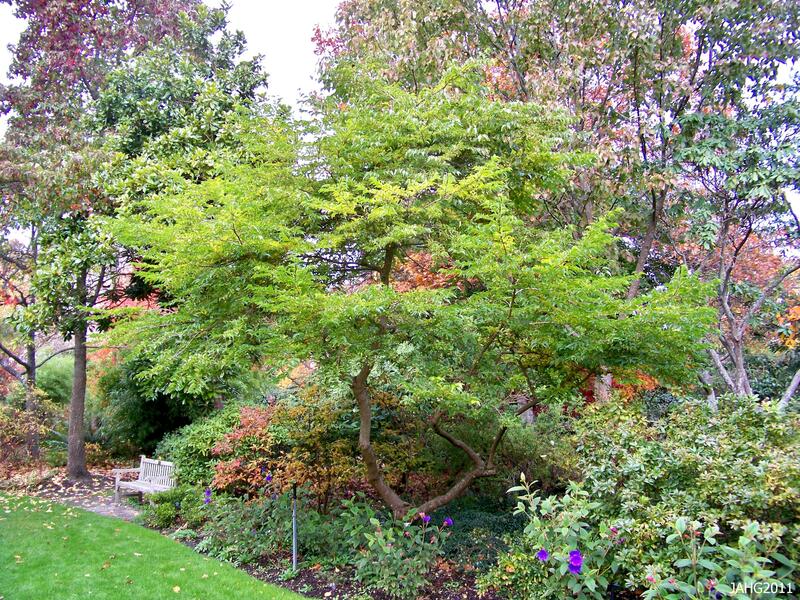 It was introduced into english gardens in 1812 with the same short-lived results. The sublimely beautiful Lamprocapnos spectabilis 'Alba' (White Bleeding Heart) is a more delicate plant than the more common pink variety. 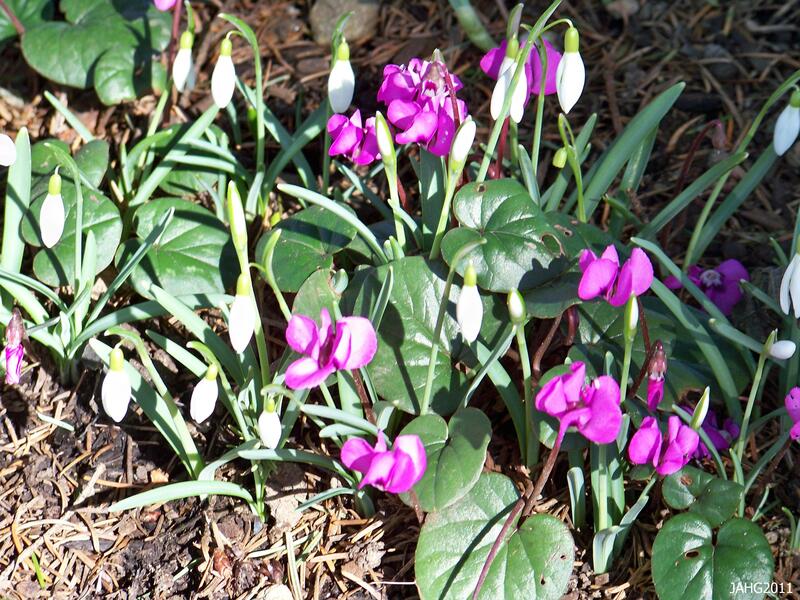 In 1846 Robert Fortune (plant explorer extraordinaire) purchased a live Bleeding Heart plant at a nursery in Shanghai China and sent it back to Kew with a note saying that he thought this plant would become very popular with gardeners. 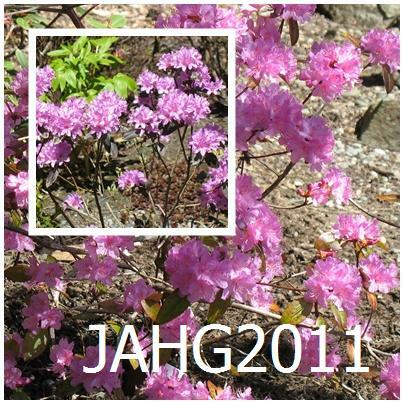 within 5 year the plants were being sent to continental Europe and North America and were well-distributed in Great Britain. It was such a hit that by the end of the 19th century it was seen as being a ‘cheap’ (as in common but very charming.) 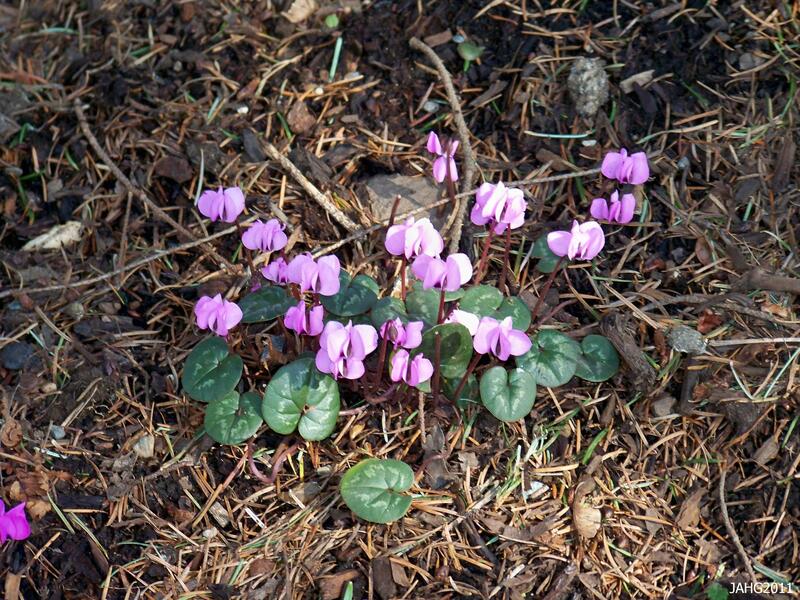 although William Robinson saw its beauty describing the flowers as ‘resembling rosy hearts’ (that are) ‘in strings of a dozen or more gracefully borne on slender stalks’ (and) having ‘remarkable beauty’. 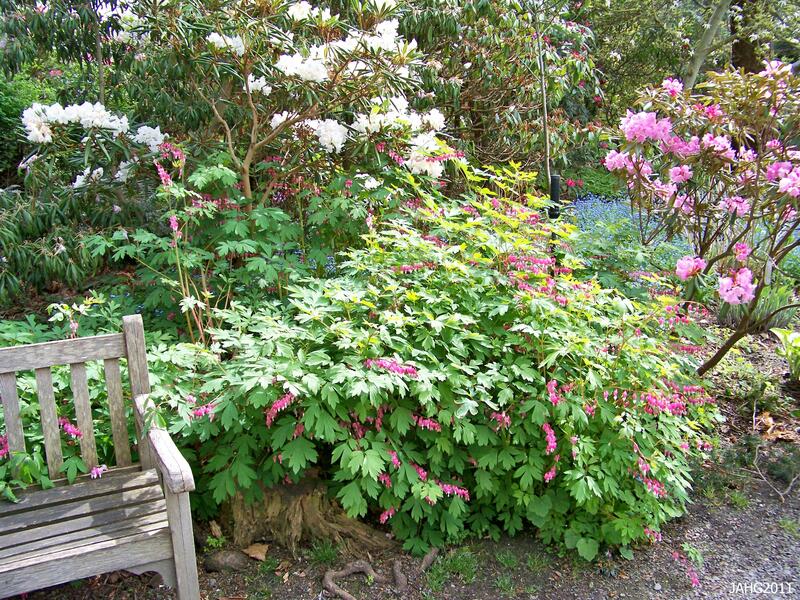 The delicate foliage of Lamprocapnos spectabilis (Bleeding Heart) is a perfect foil for more solid plants and structures like this bench. 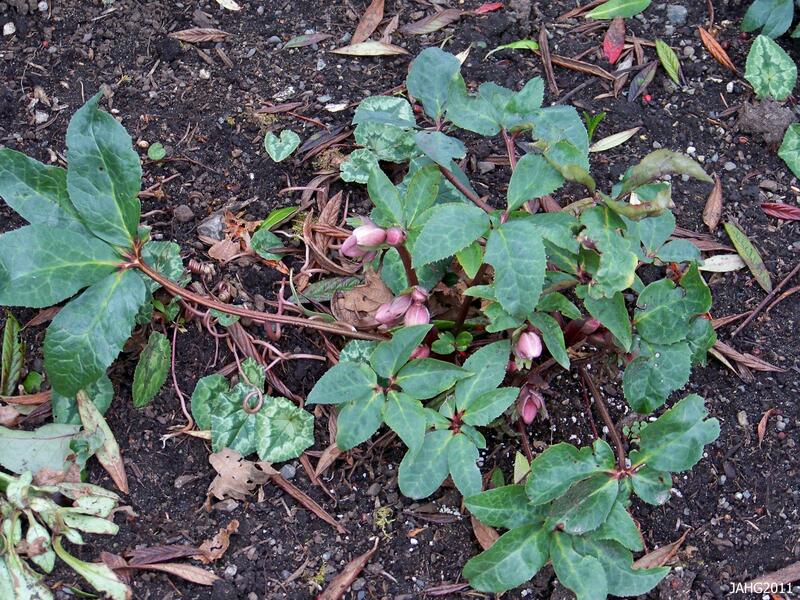 Lamprocapnos spectabilis (Bleeding Heart) is from asia but is found in a wide range ; from Siberia through Korea into Japan and south into China. It is not common anywhere in the wild. It would be found in fairly low to quite high elevations from 30 -2400 m.(100 – 7900 ft.). 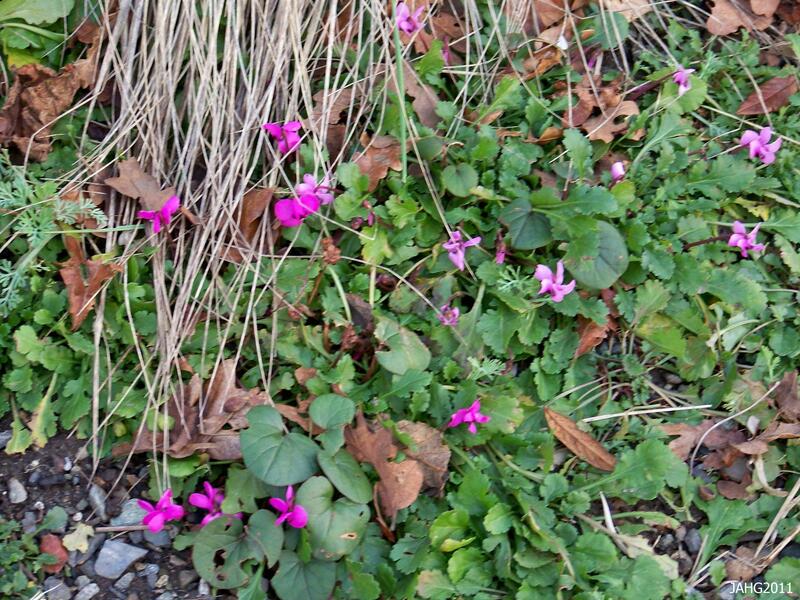 With this diversity of range it is not surprising to find it is quite hardy surviving -40 c and f. tempetures (zone 3 where I spotted my first plant as a small child). 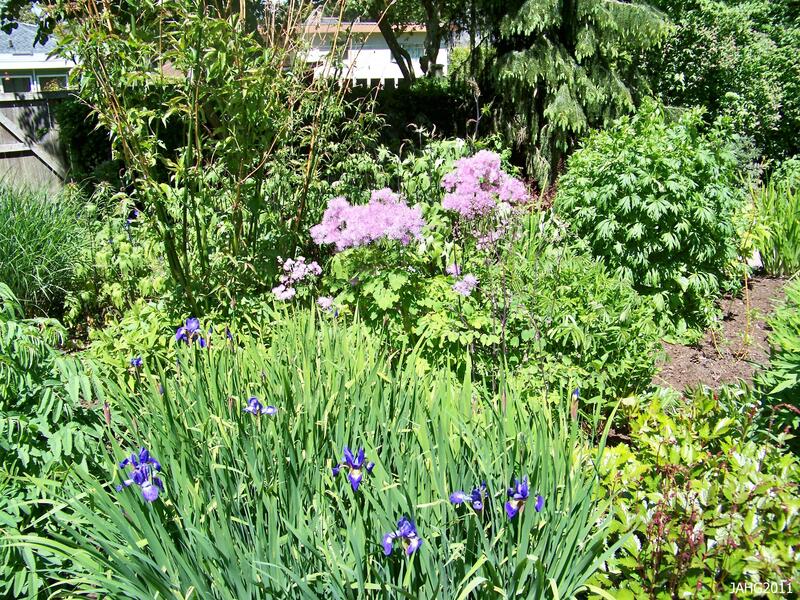 An added benefit is that these plants are deer and rabbit resistant and should be used by gardeners who have these problems. 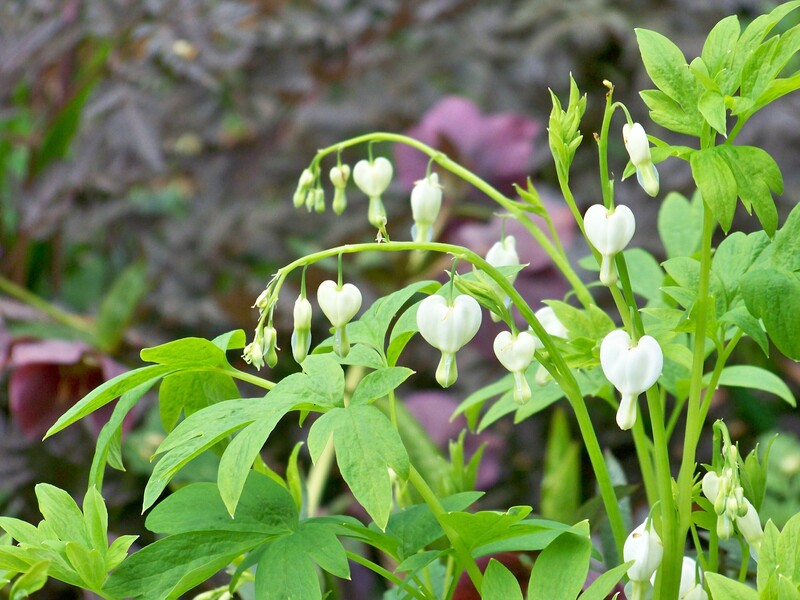 Lamprocapnos spectabilis (Bleeding Hearts) might look delicate but they are tough, hardy plants. 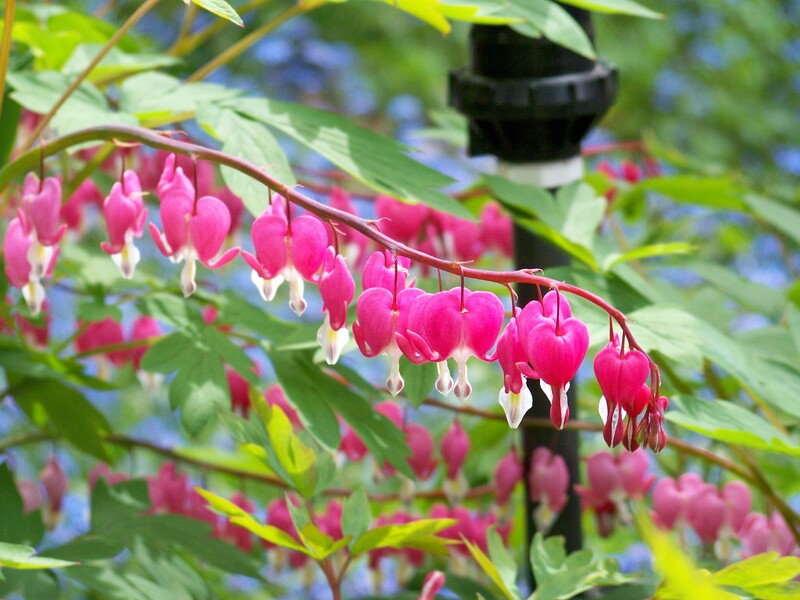 Growing a Bleeding Heart is easy; you will need rich humusy moisture retentive soil, dappled exposure and a site which offers protection from winds which can damage the foliage and blooms. 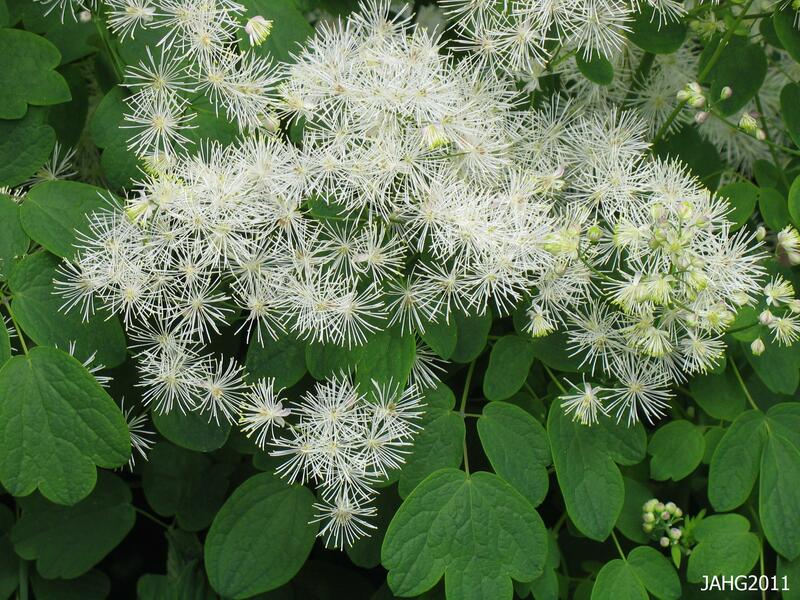 The plants if they are happy with produce a large vigorous clump which produces dense roots. They grow to be about 1 m.(3 ft.) high by about the same wide. 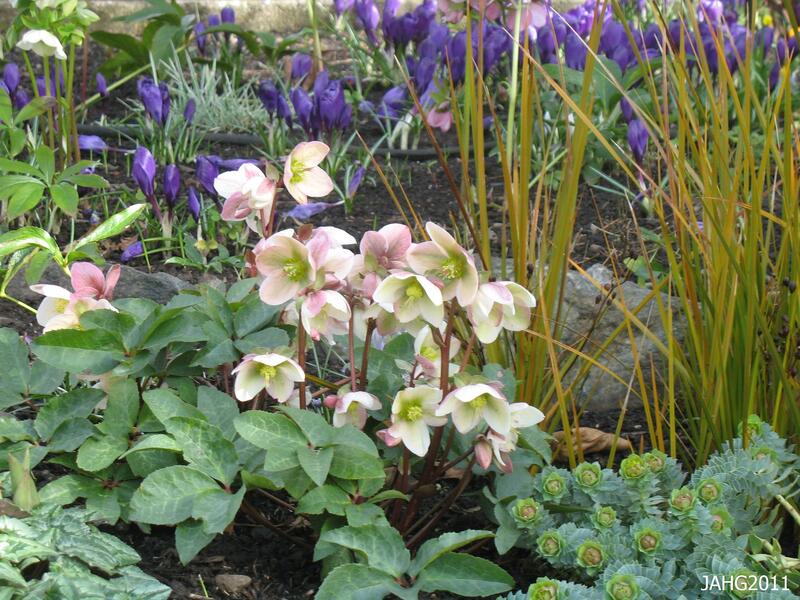 Plants do have brittle roots so care should be taken when planting near its base. 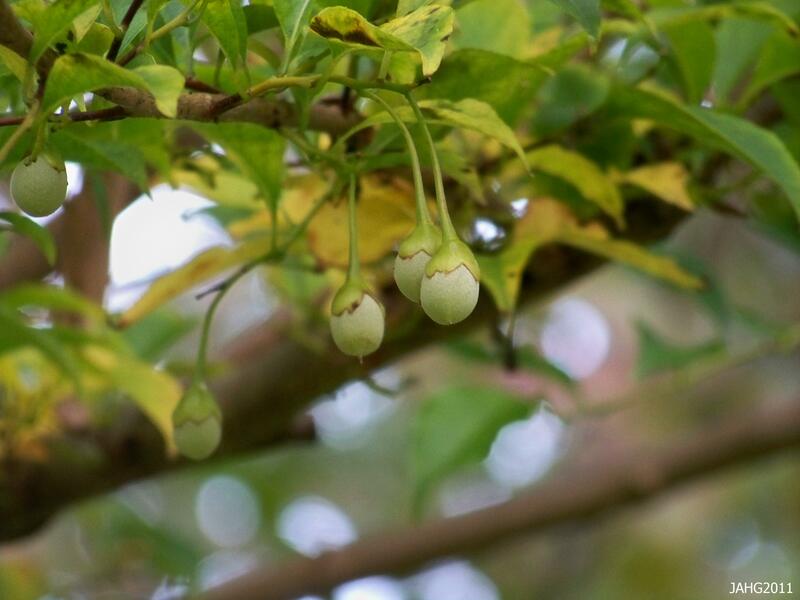 These plants are easily divided in autumn or early spring, growing them from seed is somewhat tricky as it has to be sown as soon as it ripens. 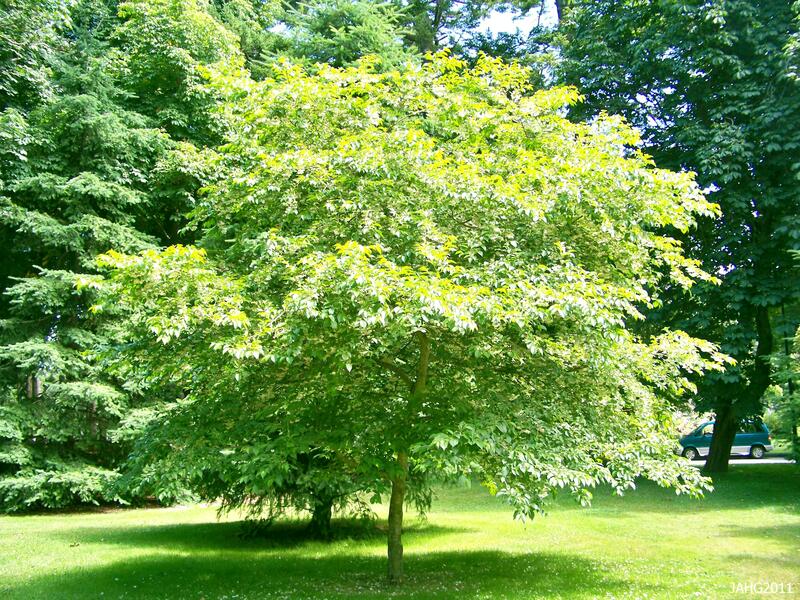 There are several forms you might be interested in buying, my favourite is the glistening white Lamprocapnos spectabilis ‘Alba’ which has beautifully green leaves. 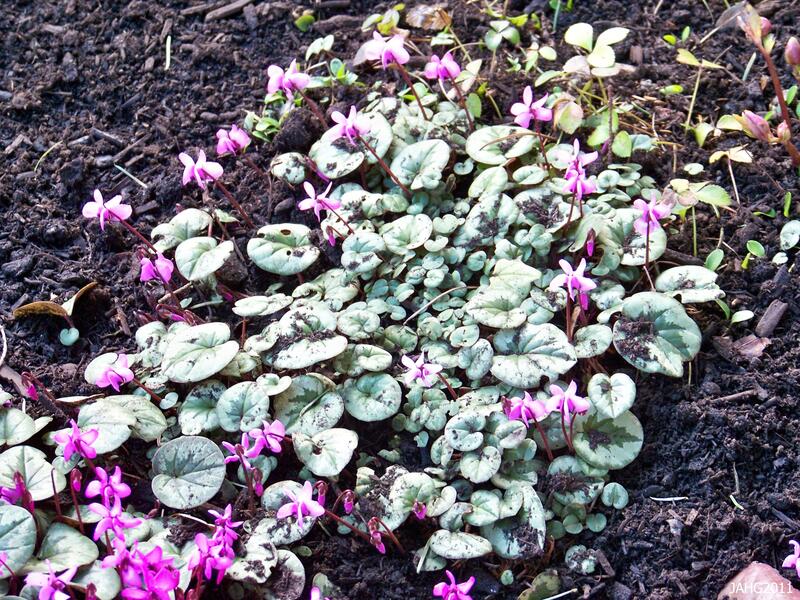 You might prefer ‘Gold Heart’ although I find the golden chartreuse foliage clashes with the pink flowers. 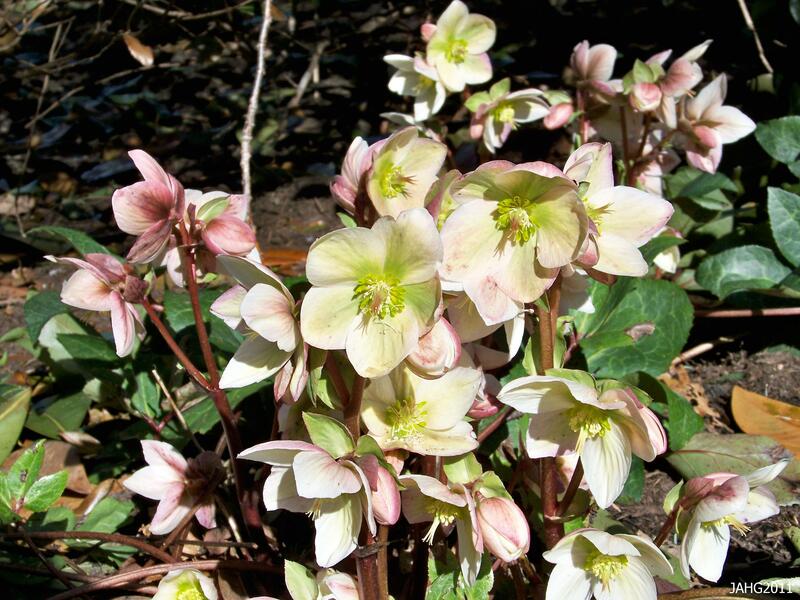 A new addition is Valentine’ which has deeper, richer colored flowers. 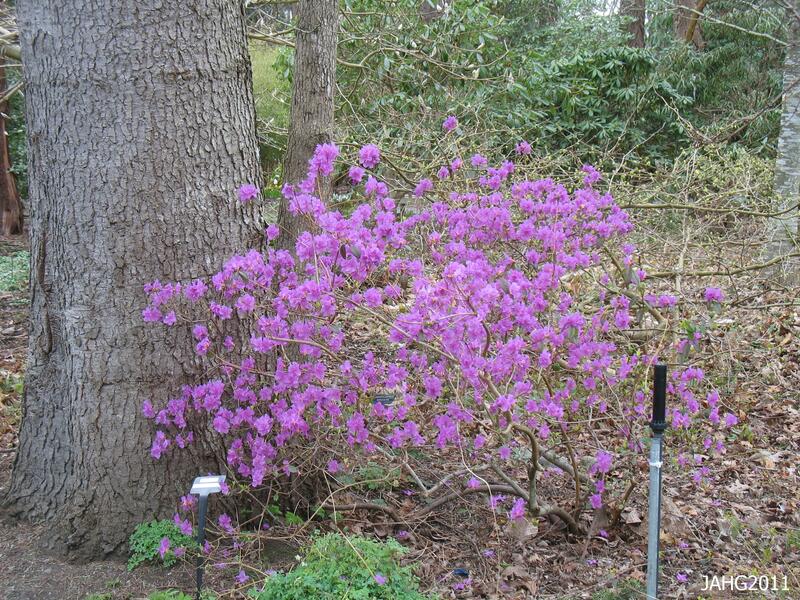 This collection of Laprocapnos spectabilis was a single plant last year and is happliy growing in its new location. For the most part Lamprocapnos spectabilis is a carefree plant with few pests other that the odd aphid or slug slimming around. 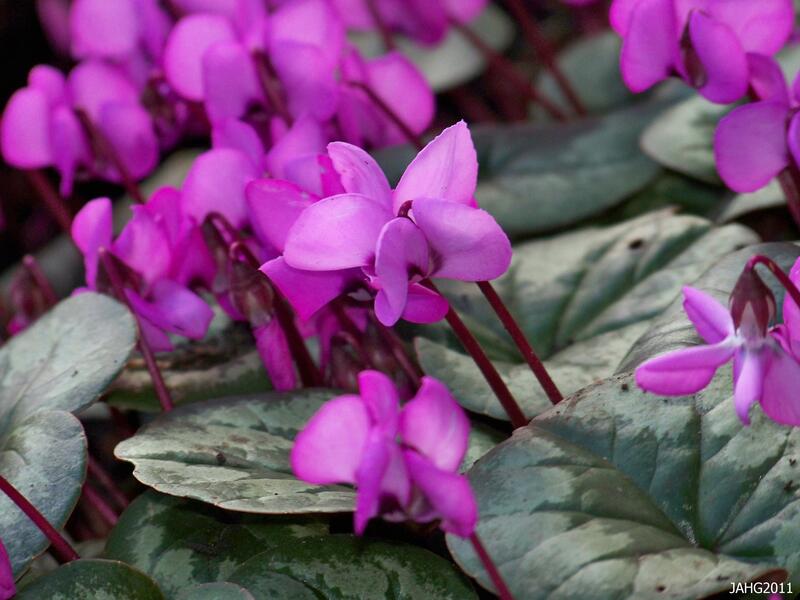 Often plants get messy looking after they bloom, you can cut them down to 15 cm. (6 in.) 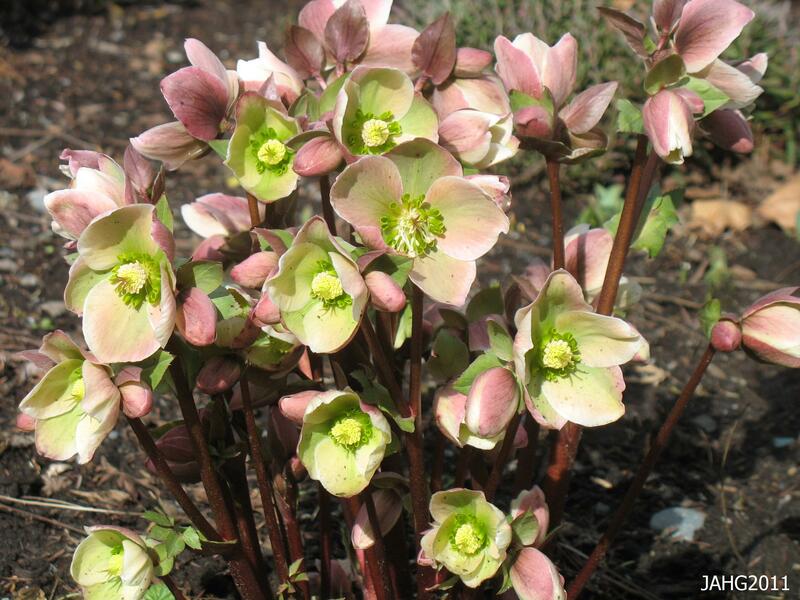 and they will regrow with new vigour and often will produce a smaller crop of flowers in late summer or autumn. Late autumn offer up golden tones which are appreciated. 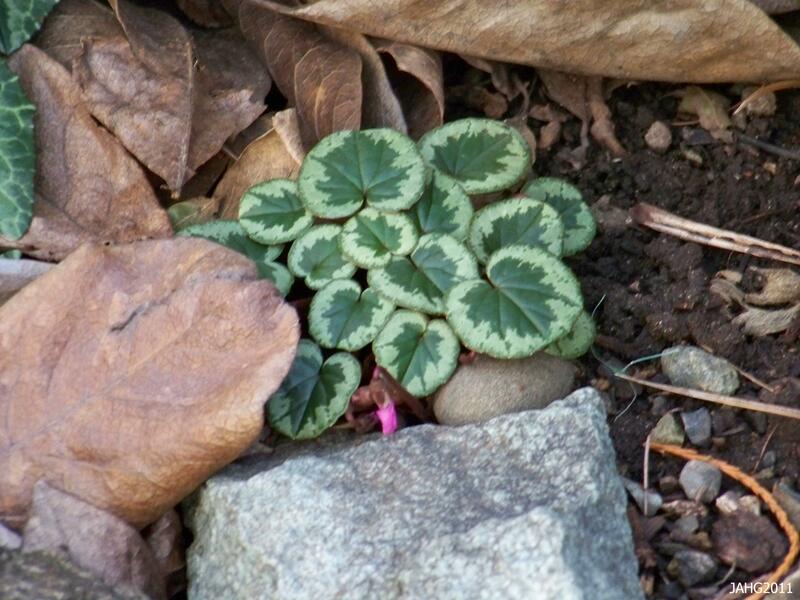 This plant can be used in a variety of ways; it is often a foil for bold foliage and mixes well with the more dainty ferns. 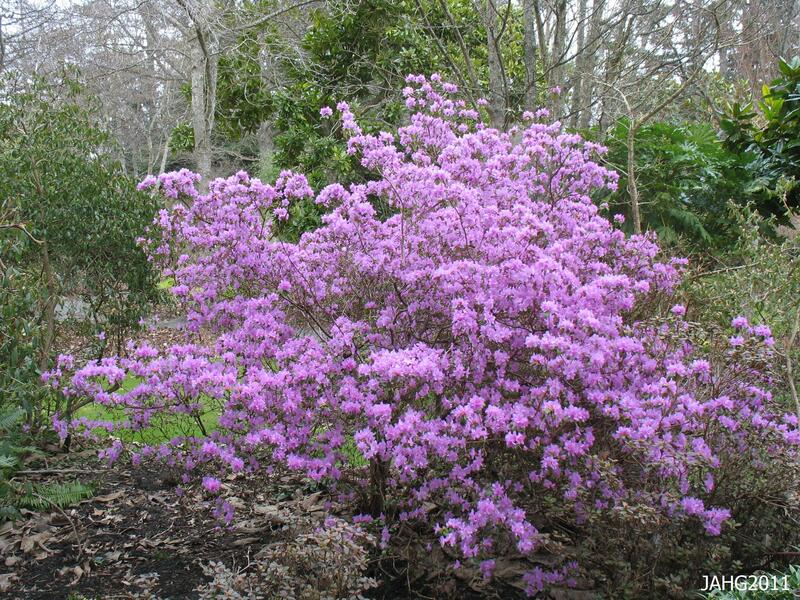 It is used as an accent, specimen, in shade and woodland gardens, in perennial borders for spring interest. ……………Hope you don’t change your mind and decide to leave soon………….